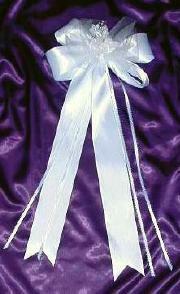 PLEASE SCROLL DOWN TO VIEW SELECTION OF CANDLE DECORATIONS. 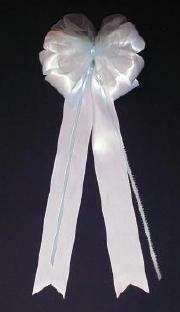 Ribbon is available in white, white with gold or silver accent, pink, or blue They can be custom designed to your needs. Candles are shown attached for display purposes only. They will not be shipped with the decorations, however, we will enclose instructions for you to easily attach the decorations to your own candles. Take 10% off price of candle decorations when purchased with Stefana. 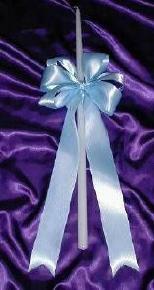 ALL CANDLE DECORATIONS ARE AVAILABLE IN WHITE, PINK, OR BLUE. Please specify.